On February 18th, the main meat restaurant Bochka invites the visitors to take part in a master class by two chefs – Vassily Emelyanenko, a popular cooking shows TV presenter, and Igor Bednyakov, who needs no introductions. Rib eye, tibuon, round rumb, tornedos … These words are like a mantra for a meat gourmet. But if their meaning is not yet entirely clear, you have the chance to learn the difference between ‘chateaubriand’ and ‘filet mignon’, the main principles of meat selection for every kind of steak and the difference between ‘mediumwell’ and ‘welldone’. Cost of participation – 2500 rubles. 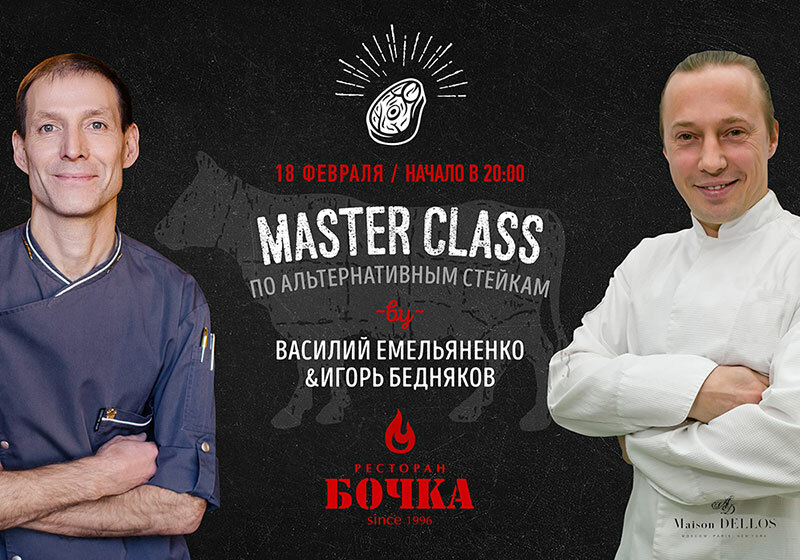 Don’t miss the moistest master class in Bochka restaurant!